Kiss My Smash: Crafting party! Recently, I had my first sleepover with my cousins. I have wanted to have them over for an evening for quite some time so I had some big plans. I thought this would be a perfect opportunity to have a crafting party. So before they arrived, I covered the table in newspaper and my crafting supplies. 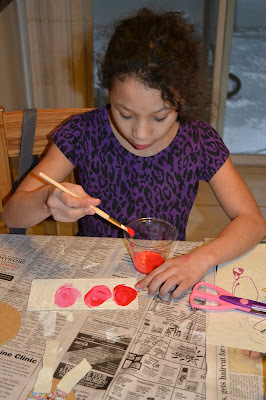 I envisioned the kids making cute red Valentine's for their mom. Of course it didn't quite turn out that way. Ice, the youngest, was most happy to play with glitter glue and fireworks stickers. E decided to make a man out of some scrap wood. He told me the man was a green smurf, rather than a blue one. He made sure I knew that smurfs are normally blue, so that was why this one was so special. Ice also thought it'd be good to paint as many things blue as he could. Overall, I learned that if you want kids to make Valentine's card, you should probably only put out supplies to make that one craft. Putting out all of your crafting supplies creates chaos. 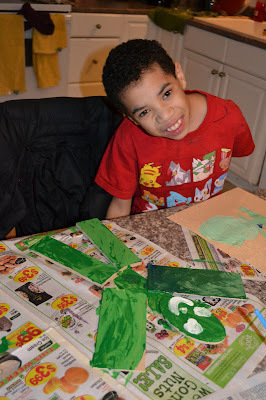 Even though the crafts weren't as 'themey' as I had hoped, I certainly loved watching them create something that came straight from their heart. P.S. - how cute is this face? I didn't even ask for that pose. It was an Ice original. He never complained when I kept taking photos. The bigger kids were much happier playing video games and watching Harry Potter than posing for me. Sleepovers are a great time. I would suggest it to anyone!